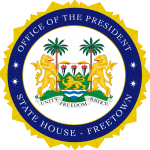 State House, Freetown, Wednesday 10 April 2019 – New Commissioners of the Human Rights Commission have today subscribed to the oath of office before His Excellency President Julius Maada Bio at State House. Parliament at its sitting on Thursday 4 April 2019 adopted the Thirty Second Report of the First Session of the Committee on Appointment and the Public Service and approved commissioners Sama Yarjah, Simitie Lavaly, Dr. Gassan Abbess with Patricia Narsu Ndanema as Chairman and Victor Idrissa Lansana as Vice Chairman of the Commission. Speaking on behalf of the new commissioners, Chairman Ndanema expressed their deepest gratitude to His Excellency President Julius Maada Bio for giving them the opportunity to serve on the Human Rights Commission. She said that they were ready to serve and promised that they would endeavour to improve on the human rights situations in Sierra Leone. “Your Excellency Sir, we are all aware of the huge task at hand, especially in terms of rebuilding the image of the Commission and also for the protection of the rights of the right holders of the country. We want to assure that we are fully equipped with the relevant and professional experience and academic background to push forward human rights situation in this country,” he explained. His Excellency President Julius Maada Bio congratulated the commissioners and said they had been meticulously chosen to serve the country, adding that for every governance structure the roles of the Human Right Commissioners were always very important. “I want you to know that people have a lot of expectations, and as a nation, we are going to depend on you to protect the human rights of all citizens of this great nation. I want to assure you of government’s support,” President Bio assured.